Welcome! We are a Karting Club that invented and races extremely affordable 5hp, Single Wheel Drive "Gas stocker" karts (a homemade hybrid mix between a WKA racing kart and a conventional yard kart) for a Points championship every summer at Galletta's Greenhouse Karting Speedway and formerly a Gas Stocker division at Oswego Speedway's Clay Kartway. 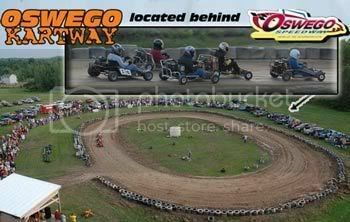 We can race in conventional carting tracks or backyard speedways. We also record weekly WKA dirt karting classes in the Oswego area in addition to our own and make them available on DVD! Join us racing by either building your own or renting one of our team backup karts. You can also just watch in person, or by buying our DVDs. Please read on and learn more about our extremely affordable brand of highly competitive racing! Race competitively (not just last place) for a few hundred dollars per year! Through the 2000, 2001, 2002, 2003, 2004, 2005, 2006, 2007 , 2008, 2009, 2010 & 2011 seasons. LIST LAST UPDATED AFTER 10/10/2010 RACE. Jeff Tetro "Chet the Jet"
Above is just a list of drivers who have won at least one feature event at Galletta's Backyard Karting Speedway between 2000-up, with their total points as tie-breakers. For a list of all drivers who have entered a Galletta's Speedway Feature event, their total points are on this webpage. (t) = Includes a two-way tie for Feature Win (counts as 1 each person). < = Includes Non-Winner's Event Feature Win (No prior winners allowed in that event). ^ = Includes rain-shortened or break-shortened Feature Win (not a completed feature). Red ° = All wins acquired driving in larger than others on track/since outlawed "OHV" motor. (All others in black are with approved FH 5hp-type motor). Pictures = Raced in at least one race recently, or a videotaped event (like the Galletta's Klassic). Profiles = Regular Drivers and Klassic Competitors have driver profiles (Click on highlighted pictures). - 218 different drivers have raced in 271 features at Galletta's between the 2000 and 2011 seasons. - 40 of these drivers have won at least one feature at our track. - And of those 271 features, only 15 were won by a motor not built/tuned by Matt Stevens. (all of which used racing cam before they were legally instituted into our rulebook), and the other 8 were in a larger horsepowered, different type of motor (unknown OHV motor that had unknown and illegal motor enhancements, since barred in order to make it a one motor class). Through the 2006, 2007 and 2008 seasons (After every "Gas Stocker" - right-turn, gas motor with supposed "box stock motor" rules - event held at Oswego Kartway from 6/23/2006 -thru- 9/4/2008). This class was the only division (other than the "Opens") at Oswego Kartway with two different motors, an odd rule enforced onto our club and by that track's operator Jim Losurdo, an irrational, stubborn, obstinate man. After the flatheads and OHVs split in 2008, Jim Losurdo barred both classes ironically in favor of the left-turn Clones (which are supposed to be box stock motors), oddly called "Pro Stocks." Apparently they aren't box stock clones anymore, so I guess history does repeat itself. Red Text = gas 6.5 horsepower Overhead Valve motor with Animal parts; Black Text = gas 5.0 horsepower flathead motor with shaved heads. Above the Oswego Kartway 1-WD Gas wins. Total points are on this webpage. * = Includes a two-way tie for Feature Win. Red = Majority of races in larger/un-inspected "OHV" motor. All others in FH 5hp. Pictures = Raced in at least one race during a videotaped event recently. ~ = Includes a time-trial victory (with unapproved raptor carburetor). NOTES: Most of the above list is mixed-motors from 2006-08, however, there was a split into two motor divisions during the 2008 season when the 6.5hp OHV "Outlaw" karts used Animal upgrades and spiked fuel, and the "Galletta's" 5hp flatheads used Dyno 94-SS cams to combat the unexpected and unapproved change (that the track operator allowed the Outlaw team Animals without approval from the Galletta's team). After this point, the class split into two (as wanted since 2006, and what lost Oswego several drivers from our family-and-friend/affordable-oriented club because of the apparent bias against us) only 5hp Gas Stocker events were counted in this points series, as it is the Galletta's-Legal motor from 1996-2009, while the Gas Animal Outlaws ran their own, separate races (not counted here). Also, James Losurdo banned our class before the 2009 season (an inaugural class which supported the track since its inception before most other classes were even there, despite unfair bias and no enforced rules) in favor of a box stock clone class (ironically enough, we were replaced with what we tried to be - box stock motors - while Jim told us to "make your motors faster at any cost or lose", and when we did speed up our karts, he banned us. What a two-faced loser. ), so these stats are final. No Clone class is counted in these stats, as they are post-Galletta's Karting Club's Banishment from the track by Jim Losurdo. We will never be back at that track as long as that operator - the most biased, unfair, belligerent, anger-prone, two-faced, backstabbing, grudge-holding, immature, stubborn, temper-tantrum-throwing, and unabashed cheat-happy man we have ever met - is completely gone from that track, no matter what motor or chassis type that our club adopts in the future (and it probably will be a box stock OHV, probably clone, but it remains to be seen after our 5hp gas flatheads finally are phased-out, which has not happened yet). * = Matt Stevens led the last lap under green, but when the yellow flag came out in the third turn, Wes Stevens passed Matt at the line under a caution, and the track operator awarded Wes the win. It was the final race our Galletta's Karting Club run at that small, overpriced, semi-pro track, which ignored our rules for three years and allowed forced larger-motored karts into our class for all three seasons, and replaced our 1-WD gas stocker Briggs class with 2-WD gas stock clone class and proceeded to mock and threaten us for a year afterward. It only stopped after the police were notified of the threats. 1. The 1995, 1996, 1997, and 1999 points seasons are currently not digitally filed and not included for the time being. However, with only having 3-4 karts, only Matt, Chris, and Wes Stevens scored wins during these seasons, and only an occasional friend or relative joining us for a few races here and there, their inclusion is not as important as the 2000-and-up series as above where we had more karts and drivers on track and visitors actually winning (Chris, Matt and Wes were not beat all through the 1990s and only defeated each other). If the stats to the 1990s are are found, they will be added in at a later date. 2. Some names could not be digitally transferred correctly or completely, as some were signed so illegibly, that they could not be read. Some of these cases have incomplete names or nicknames only. In rare occasions, some names were not recorded at all. If you are aware of any errors, or you are one of these people with missing, misspelled, or incomplete names, please contact me and I'll repair it as soon as possible. Either way, unless you want to bring an illegal motor to race against us or crashed purposefully and asked for your money back (you know who you are) we want most of the above (probably 97% of you) racing with us, so come on back! 3. Since races are often longer nowadays (the karts are sturdier and break down less than 1995-2005), newer drivers (2005-up) often have higher points-per-race averages than older drivers. This means that although they may have less races, they have ran more laps, as the Galletta's Points Scoring System rewards more points for more laps. The bigger the race, the more points to be scored per race. If you want to score well , then you come often, but if you only come to one, come to the Annual September Saturday 's Galletta's Klassic Championship. 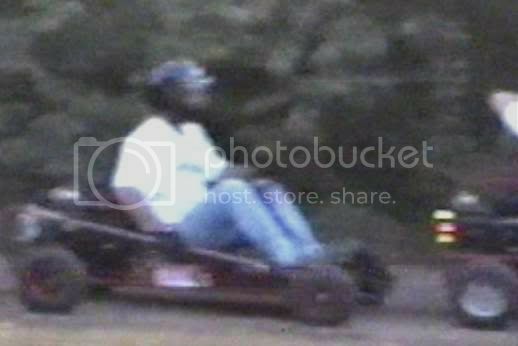 1993-2004: Every go-kart entered in the Galletta's Karting Speedway and points system from 1993-2004 was a 100% box-stock flathead (FH) 5-horsepower Briggs & Stratton motor that runs on gasoline; all racing parts and alterations were forbidden. All chassis are Single-Wheel Drive, clockwise-turning racing karts. 2005-up allowed hand shaved/milled heads (see below changes and controversy). No internal or external racing modifications, nor shaved heads. 2005-up: Since the middle of the 2005 season, rules had to be altered each season to compete against drivers who brought larger 6.5hp OHV motors and entered our races, sometimes forcefully by other track operators. For this reason, we allowed shaved heads, racing rods, some "non-slapper" race cams, and a minimum weight before banning the motor from our races entirely to keep costs down and competition equal and friendly. The entire story, including what is and isn't legal in a Galletta's Gas Stocker Kart event are found on the newly updated Galletta's Go-Kart Racing Club's rules page. And why did we stop racing box stock and began to make any enhancements at all? Because. What is a Galletta's Go-Kart, AKA a Single-Wheel-Drive "Gas Stocker" Kart? Read here! The Oswego Gas Stocker Kart Club races at Galletta's Greenhouse Kartway & formerly Oswego Speedway Kartway. All pictures & text © copyright 1990-2011 Galletta's Stock Karting Club & Chris ChrusherComix (unless noted).